The Jets signed 3 unrestricted free agents: DB David Barrett from Arizona, LB Eric Barton from Oakland, and their own free agent, Placekicker Doug Brien. Barton and Brien would go on to become somewhat intertwined in Jet History. 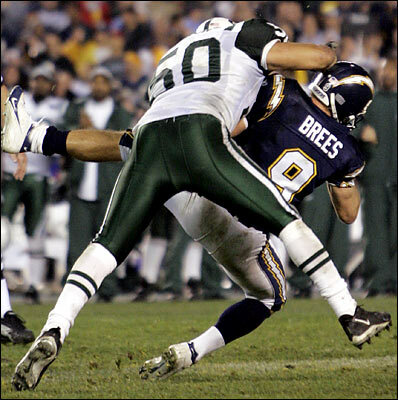 If it wasn't for Brien's 28 yard field goal in OT in the 04 Wild Card playoffs against the Chargers, Barton would likely be remembered along with Mark Gastineau for one of the most boneheaded roughing the passer penalties in Jet history. The Chargers had 4th and goal at the Jets 2 yard line, trailing 17-10 with 24 seconds remaining on the clock. As Drew Brees desperation pass for Antonio Gates fell incomplete, it looked as if the Jets had survived. Until a roughing the passer penalty called on Barton, whose arm had struck Brees' helmet, gave the Chargers a first and goal at the 1. Brees found Gates in the end zone on the next play to force overtime. The Jets, and Barton, got a reprieve when Nate Kaeding missed a 40-yard game winner in OT. They ultimately won the game on Brien's 28 yard game winning kick. And Barton's play became nothing more than a footnote in Jet History. Brien, of course, would assume the goat horns the following week when he missed two potential game winners in the closing minutes of the Divisional Playoff game in Pittsburgh.